As is the practice in the New World of Schooling, in which first graders learn algebra and fourth graders experiment with nuclear fission in reactors they build themselves out of old toilet paper tubes, my kids were assigned summer homework. One of Zoe's assignments is to keep a journal. The only instruction given was that she must write in it at least three times per week, but the length and subject matter of each entry is entirely up to her. What we have here is a unique opportunity to gain insight into the thoughts and hopes and dreams of a 7-year-old girl. What's important to my little girl? What makes her tick? So far the answer is: mostly food. I had CoCo Puffs for breakfast. They made the milk brown. 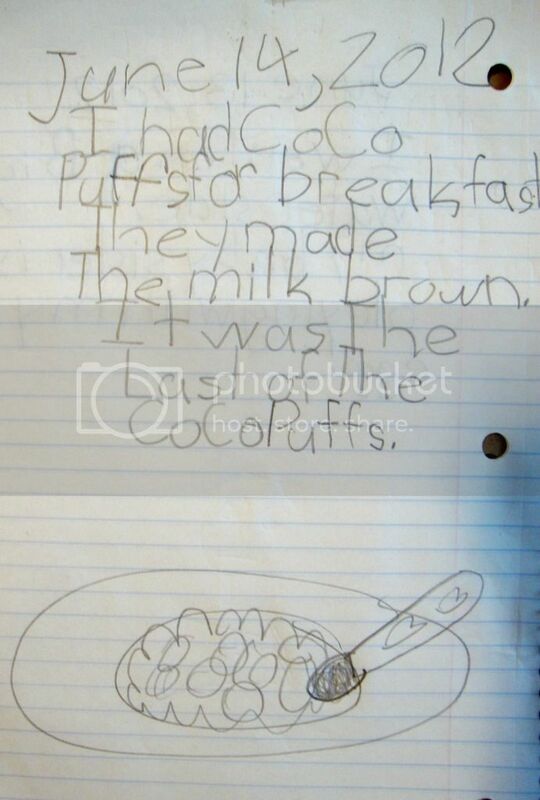 It was the last of the CoCo Puffs. *She was not happy that we were out of CoCo Puffs, to say the least. Apparently it was the most noteworthy thing to happen to her all day. 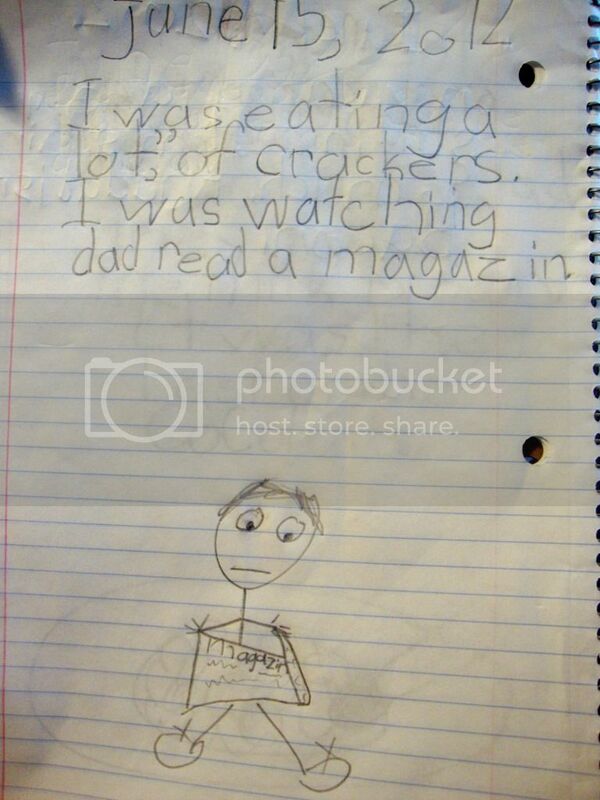 I was eating a lot," of crackers. I was watching dad read a magazin. *observation: He does not seem to be enjoying himself. In fact, his magazin appears to be really boring, or contain bad news about Katie and Tom's break-up. I was reading a book called The 7 year old wonder book. And in the morning I looked at a Mtn Dew bottle. *mental note: Give her some toys to take to her dad's house. on vacation Jake was still in bed. I mist him so much. And dad is making bacon. *aside: I was told later that all they had for breakfast was bacon. C'mon, where are the CoCo Puffs? I'm wearing pajamas. Jake's watching TV. I'm going to eat macaroni and cheese. *Whew, I almost thought she wasn't going to mention food in this one, but then she snuck it in at the end. Okay, I know these are out of order, but I had to save the best one for last. Remember how Jake and Zoe went with their dad to a remote cabin for a few days? I've been there, and although it's cozy and nestled in the glorious bosom of Nature, luxurious it is not. It's built for men to use when they go out in the woods and shoot things from the treetops and drink beer. You do not get the impression that you need to wipe your feet when you enter. There's a bathroom, but you have to pump your own water to pour in the tank for each flush. The bathroom door is made of cardboard. You get the picture. Zoe had never been to the cabin before, and I was eager to hear what she thought of it. 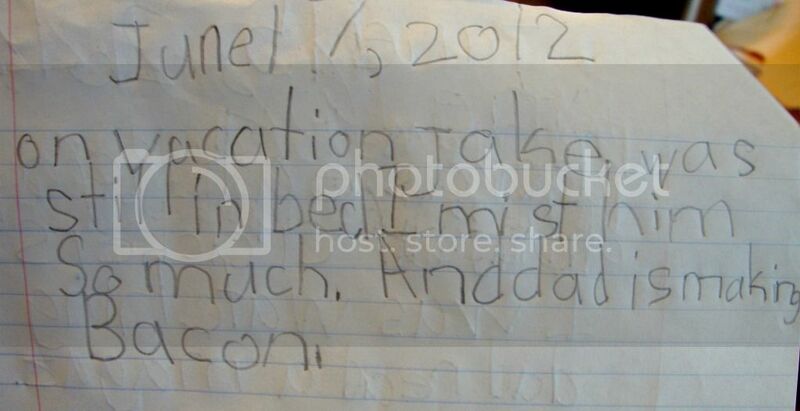 Her journal entry pretty much summed it up. Dad told me to calm down! Our cabin looks like people did not spend a lot of money on it at all. So true, little princess. So true. Please click below to vote - 1 click is all it takes! And to clarify, my daughter isn't a total priss. She might not have been impressed with the accommodations, but I hear she almost killed her brother with a BB gun, so there's that. Labels: children, food, school, vacation, What did you say? Please tell Zoe that I felt the same way about the beach house we rented from a friend a couple of years ago...They REALLY didn't spend much money on it! Blech. And I am DELIGHTED that your kids see Dad reading. It's so important, especially for boys, to see men reading. It makes them more interested in becoming readers, themselves. YAY for reading! Does it count if he was reading Guns & Ammo? Because I bet you $50 he was reading Guns & Ammo. reading is thought of highly around here. i just hope he wasn't on the john at the time, which is entirely possible considering the cardboard door on the cabin restroom. That's a very creative way to get the point across, and her printing is nice. I still have my very first diary--age 9--in which I wrote "gonna get down, get funky tonight" on a random Tuesday. I don't even remember going through a disco phase. That sounds like a Tuesday thought to me! Monday: Boogie. Tuesday: Get funky. Wednesday: ER visit. I still have an old diary (okay, it was a blank check book register) in which I wrote, "I love Michael Jackson." And really, who didn't back then? I think I just wanted to marry him so I wouldn't have to change my last name (I was quite a practical child). Great, now I really want macaroni and cheese. :) Your daughter's hilarious. I love to see her experimenting with punctuation. 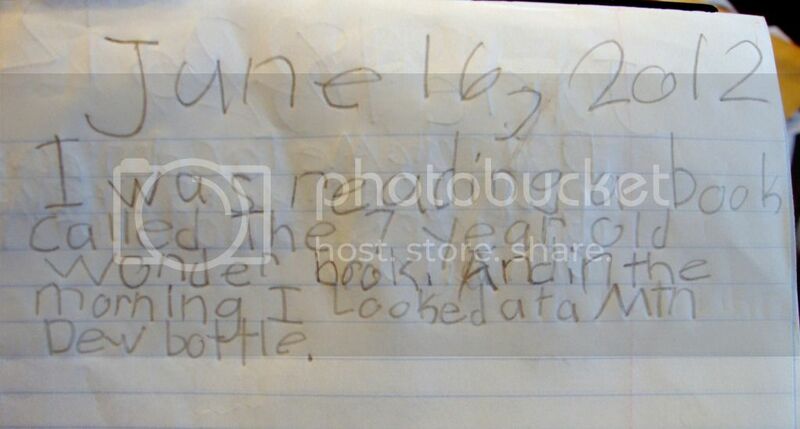 Those entries look a lot like the ones from my diary from when I was younger last year. Then I'm really sorry to hear about your CoCo Puffs. This is so precious! Maybe I'll make my 8yo son do this before he is allowed to play video games. He will hate me. My older one (15) would just roll his eyes. Not happening. Zoe has a good head on her. I'd be wary of that cabin too! i just consider it evidence that's better off never having been put to paper. they can't use it against you that way. Me too - I do tend to go coo-coo for CoCo Puffs. I probably shouldn't have written a post about it, because now I'm bouncing all over the house like a pinball. 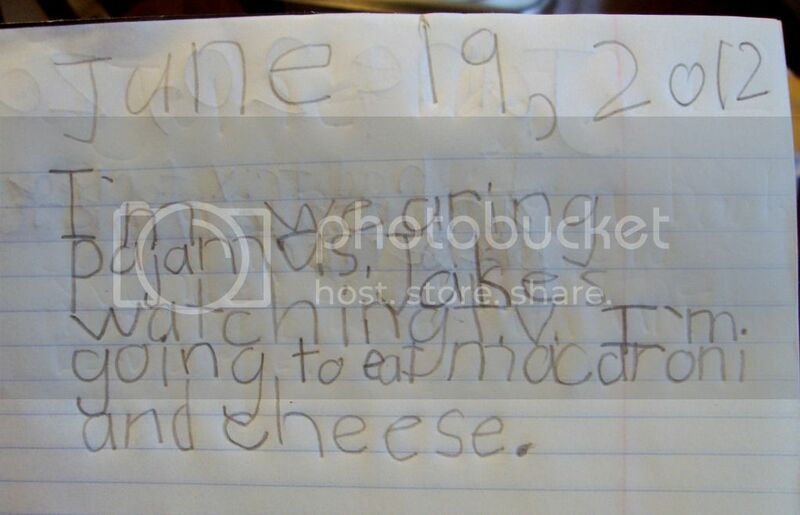 I love this idea of letting my 7 year old write my blog entry. I'm wondering if she can get to work so she can have a couple of posts ready for when I am in the middle of finals in two weeks. I love how she phrases things. I truly feel her sadness about the whole Coco Puffs things. I wasn't holding out on purpose - it's just my short term memory loss. And the long term memory loss. And the short term memory loss. My son told me a few weeks ago "You need to relax Mama"...I may or may not say that a lot. I especially like Zoe's last entry. That was hilarious. Out of the mouth of babes....love it!